Our fourth interview in our Tokyo Art Book Fair 2017 with Art Byte Critique artists is Nick West. Time in Japan: 7 years. How many TABF have you participated in? TABF 2017 will be my second artist book fair that I’ve participated in. In both years I showed my work with artists from the collective Art Byte Critique. How long have you been making books? I have been making books, on and off, since about 1998. What is your favorite kind of books to make? I’ve always been drawn to the physicality of books so I like to make books that emphasise their sculptural characteristics. Do you have favorite materials to use? I like to use simple materials. Just paper, thread and glue. What kind of books are you making for this fair? Actually, I’ve spent some time working on an installation in a gallery in the UK this summer. 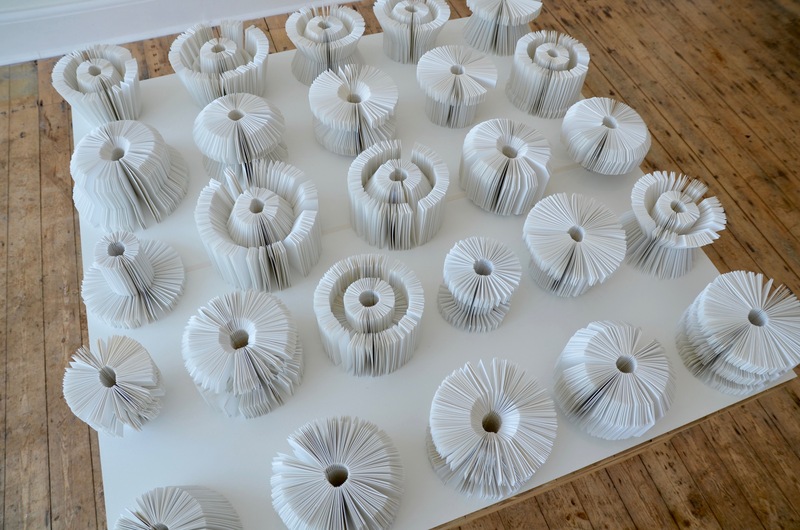 This work entailed making 26 circular-bound books cut in shapes that approximate letters of the alphabet. Although there isn’t room for the whole work at TABF, I’ll be exhibiting some images and an example book from this project alongside a separate blueprint. What did you learn from last book fair? What are you doing differently for this book fair? The best thing I saw was that the delight that people take from thumbing through books. I hope to give visitors a more tactile appreciation of my works this year. Do you have any art book heroes? Not art book heroes, as such, but I’ve long been interested in a French group called Oulipo. Roughly translated, ‘Oulipo’ means ‘the potential for literature’. They aren’t so well known but they were a group of writers during the 1960s who devised various ways of writing using constrained techniques. One novel, ‘A Void’ was even told without the letter e.
Do you have any advice for people who want to start making books? Make the book you want to read. Do you have any advice for people coming to the book fair? There’s always loads to see at TABF. Give yourself plenty of time to get lost in the books on display. This blog first appeared at The Spendy Pencil. The third interview of the Art Byte Critique’s 2017 Tokyo Art Book Fair participating artists is with Yuko Kamei. Time in Japan: Most of my life except 5 years in U.K. This year will be my second time participating in TABF. My first art book came out in 2009 as part of “on concrete” exhibition which I organised together with Jörg Obergfell and Sebastian Stumpf. Working with a graphic designer in Leipzig, Germany, it was a fun collaborative project from conception to materialisation. I worked on a similar publication in 2013 with Hikaru Miyakawa along with the show titled “Platonic Obsession”. For this one I took all the initiative from the layout to selecting paper, ink color, and binding methods. I began to take book making more seriously recently especially after my first TABF in 2016. I think I will produce more in the coming years. I like books with a feel of somewhere between DIY and mechanical reproduction, which might explain why I employ photography as a main medium. Picture of Yuko Kamei’s work in progress. Photo courtesy of the artist. The new book is called “The Great Stillness”, and it is based on a photo series which I have been working on since 2012. Each picture was taken to be printed in a large size so that one can see both the whole scene and details, but for turning them into a book I wanted it to be a handy pocketable size while keeping the in-and-out movement of picture viewing. This is gradually determining the book structure, and I would like to be playful about combining different methods of printing. Like music, this will be the first remix of the ongoing project, and there could be many more versions to come. The great thing I learned last year was that people who will buy my book exist. Someone I don’t know took my book in his/her hand, flipped it through, liked it, and brought it home. My idea somehow clicked their mind, and I think that is very special. Because of this I am approaching this year’s TABF little more confidently. I hope it happens again this year. How did working with Art Byte Critique help you prepare your work? ABC for me is a serious yet inclusive place where I can be myself and fuelled to do what I do. Going to the monthly get-together helps me to get back on track and be productive. What would you like people to know about your books? Making books is like creating a framework to perch upon for the ideas that float inside my head. It is becoming an important medium for me apart from photography. Arthur Huang took time out to do a Q &A session for the interview series with Art Byte Critique members participating in the Tokyo Art Book Fair. TABF runs from October 5 to October 8th. 2017 will be the fourth time that I have participated in the Tokyo Art Book Fair. I like to make books which have something unique or unusual in their structure and form. I have a fondness for transparent and translucent materials although those materials can be a challenge to translate into book form. What is the biggest challenge for you when you make a book? Finding a balance between content and form like any other creative genre continues to be the biggest challenge for me. I often struggle with finding a unique form that does not overpower or silence the content of the book. I am going to publish the second issue in my Dialogue zine series where I take my practice of Daily Drawings and translate that to book form. For the second issue, I am going to shrink the size of the zine and focus on the development on one drawing rather than two opposing drawings. The second issue will be more of an internal dialogue. I am also going to publish the first 2016 Memory Walks artist book. I have worked with my Memory Walks project regularly in book form over the last four years. The sequential and archival nature of that project seems to lend itself well to the book form. For the 2016 Memory Walks Artist’s Book Project, I will create a series of 12 books, one for each month, which will consist of images from my 2016 Memory Walks eggshell drawings. The books will hopefully be released each month with the inaugural release being October 2016. The size and form of the books will resemble and eggshell, that is smaller and round. That is all I will say about the book itself so as to encourage you to come out to TABF 2017 in October! Memory Walks Artists Book ProjectImage courtesy of the artist. Every year at the TABF is different. You never know where your booth is going to be, you cannot control the weather, and you cannot control who buys your books. I think like any other creative endeavour, I have decided that I will focus on making books and zines that interest me process-wise. Just start with some blank pieces of paper and learn how to create the book structures you are interested in. Worst case, you have a spare memo pad in book form, best case, you have an awesome new notebook for yourself. It is also helpful to know that other people are working towards the same goal as you. Ever since the first time ABC participated in the TABF in 2014, there have always been a group of artists that want to work towards the next year’s TABF. There are also artists who have never made artist’s books or zines that find their way into that world. And the regular meetings, of course, as it always helps to have deadlines. If you have the time, I suggest going through the entire book fair rather quickly to scout out booths that catch your eye. On the second pass, take your time visiting booths that pique your interest. Talk with the artists. Divide your budget for buying books and zines over the number of days you are planning to visit, so you can buy that last minute discovery. I took a book binding course my senior year college in 2011 and have been making book ever since. The hardest part of making a book for me is sticking to the original theme and making a cohesive story. The books I made for this year’s fair is the product of 39 days of drawing and writing. The Tokyo Art Book Fair is nine days away. This is the second in a series of interviews with fellow Art Byte Critique members to introduce their work and talk about the show. This is the first artist book that I am showing in public. As for developing the craft I have in the past made hardcover notebooks. I get a great sense of achievement in making a hardcover handbound book. I like a book that is interesting and feel exclusive to the touch. The Plato’s Plates book is all in paper with subtle tactile variety, as this was the most suitable option for the project. But I am really fond of using a textile on the cover and a contrasting paper texture and colour for the cover pages inside. I am making one hardcover handbound book in a limited signed and numbered edition and one saddlestitched simpler version of the same book. The book is called Plato’s Plates and tells a story of transformation and transcendence through a character in a punctured paper suit. Based on my experience as a visitor last year; allow plenty of time for your visit, comfortable shoes, a strategic plan to navigate the fair and take plenty of breaks as it is quite overwhelming to see so many beautiful and inspiring books. And of course plenty of change and that extra note for that very special object of desire. You can read about Art Byte Critique artist Lyle Nisenholz here.